Annie Geitner and Paige Putnam said Friday was a chance to step outside their regular high school routines and think about themselves and their relationships to their peers. The pair of 16-year-old sophomores from Knoxville High School attended the fourth annual Teen Leadership Summit on the campus of Carl Sandburg College. A collaboration between the Knox County Health Department and the Knox County Healthy Youth Alliance, the summit’s theme was “Everyone Wants to Rule the World.” ROWVA, Knoxville, Galesburg and Abingdon high school sophomores attended the all-day event. “We do this because we are trying to help kids develop leadership skills,” said Erin Olson, the health department’s wellness promotion program supervisor and public information officer. “The students who attend have nine workshops to choose from and we added four new workshops this year č which came from student feedback. 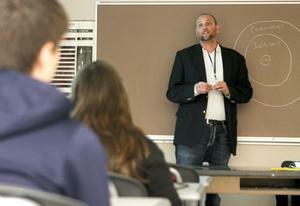 “I think the ‘Tolerance & Diversity’ workshop was really important for us,” Geitner said. “My school is very much one culture. We are all white, basically. After the Teen Leadership Summit, students are asked to return to their respective schools and integrate the information learned into a school event. The summit included a tour of Carl Sandburg College, lunch and a keynote presentation by The Media Guy, Inc. on giving second chances. Members of the Knox County Teen Leadership Summit 2012 Planning Committee include: Julie Bevenour, Safe Harbor Family Crisis Center; Ashley German Cooper, Family Planning Service of Western Illinois, Inc.; Linda Huddle, Knox County Teen Court; Paula Johnson, Knox County Teen Court; Jennifer Chancay, Knox County Health Department; Stephanie Frambes, Knox County Health Department; and Erin Olson, Knox County Health Department. Robby Dunn gives a talk on Marketing Yourself For Life at the fourth annual Teen Leadership Summit, presented by the Knox County Health Department in collaboration with the Knox County Healthy Youth Alliance at Carl Sandburg College on Friday afternoon. This entry was posted in Los Influencers, Personal, Teaching & Education Tips and tagged education, leadership, Skills, Tween. Bookmark the permalink. me. Nonetheless, I’m certainly delighted I discovered it and I’ll be bookmarking it and checking back regularly! Keeep up the great works guys I’ve incluxed you guys to our blogroll. By reducing the total amount of cholesterol your body could recycle.